Written for 11-14 year old pupils (some of the material in Books 1 and 2 is suitable for children from the age of about eight) this course covers the National Curriculum for England and Wales, Key Stage 3. The full course consists of three Textbooks, a Teacher's Guide and an Answer Book. Each of the three books has 27 chapters each of which is prefaced by an inspiring quote from a famous mathematician, philosopher etc. Also in each book there are historical notes which relate to the authors of the quotes, a list of Sutras and three other short but interesting sections (e.g. Pascal's Triangle, Fractals). Book 1 deals mainly with basic arithmetic, proportion, decimals, basic algebra and geometry, polygons, area, volume etc. Book 2 extends this, covering fractions, probability, sequences, negative numbers, percentages, equations, graphs, charts, transformations, bearings etc. Book 3 develops this further into recurring decimals, square and cube roots, division, divisibility, the musical scale, formulae, simultaneous equations, quadratic equations, proof, similar triangles, area of a circle, nets, conic sections, loci, motion, vectors, Pythagoras' theorem, triples, coordinate geometry etc. A copy of the Unified Field Chart for that book. Notes on the content of the chapters- advice, suggestions etc. Mental Tests (correlated with the books) and answers- which allow earlier work to be regularly revised, give stimulating ideas relevant to the current lesson and which develop themes from earlier tests which may ultimately become the subject of a lesson. Extension Material and answers (about 16 per book)- these consist of a 1 or 2-sided sheet given to children who work fast and get ahead of the rest of the class. Many of these are also very suitable for work with a whole class. Revision Tests and Answers- There is a revision test every 4 or 5 chapters. This includes a mental test of 10 questions. This contains answers to all exercises and other numbered questions in the text and should be available for pupils during lessons.. THE COURSE has many unusual and attractive features. 1 It is primarily a system of mental mathematics (though all the methods can also be written down) using simple patterns and methods which are very easy to understand and remember. Each lesson starts with a short mental test. 2 It is extremely coherent and unified and uses sixteen simple word-formulae, called Sutras, like Vertically and Crosswise. These formulae relate to the different ways in which the mind can be used and are therefore a great help to pupils. 3 It makes use of a "Unified Field" chart which shows the whole subject of mathematics at a glance and how the different parts and topics are related. 4 The powerful Vedic methods are delightfully easy and fun. Many problems can be tackled in a variety of ways, from right to left or from left to right, 2 or more figures at a time, etc. The techniques are also interrelated which adds to the beauty and simplicity. Through this mental approach the course encourages creativity and the use of intuition in mathematics, in contrast to the modern, mainly analytic, approach. Vedic Mathematics is already being taught with great success in many schools and the response to this course has been extremely encouraging. Book 1: 214 pages. Book 2: 253 pages. Book 3: 281 pages. Teacher's Guide: 255 pages. Answer Book: 82 pages. P.S. : I have your "Cosmic Computer" books on my desk and use this to prepare for my VM class. I enjoy them a lot. Dr S. Sreenath, Professor of electrical engineering and computer science and Vedic Maths tutor in the U.S.A.
Vedic (pronounced 'Vaydik') Mathematics is an ancient system of mathematics originating in India in Vedic times. It was rediscovered between 1911 and 1918 by Sri Bharati Krsna Tirthaji (1884-1960) who studied the ancient Sanskrit texts called the Vedas. The date these texts were written is unknown but the content of the Vedas was passed on by an oral tradition long before writing was invented. The Vedas are said to cover every area and aspect of knowledge, including for example, ethics, grammar, architecture, astronomy. The word 'Veda' literally means 'knowledge'. Since the publication of his book "Vedic Mathematics" (reference 1) in 1965 interest in this system has been growing and some schools now successfully teach it. 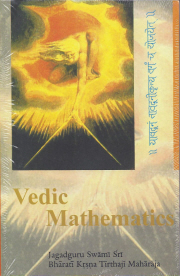 Many teachers attending courses and talks on Vedic Mathematics in recent years have expressed a strong interest in teaching the Vedic system in their school, but not without a textbook. This course has been written to meet this need. It is based on careful study and research over the last 27 years and is being tested in various schools. the use of a Unified Field chart, its effectiveness over all ability ranges. The Vedic system is extremely refined. The methods are simple and complementary, so that for example 'long' division is a simple reversal of the one-line multiplication process; similarly with squaring and square roots. Anyone familiar with the Vedic system will be aware of the remarkable Vedic techniques: 'difficult' problems or huge sums which can be solved immediately by the Vedic method. These striking and beautiful methods are just a part of a complete system of mathematics which is far more systematic than the modern 'system'. Children are inspired by these delightful techniques and often ask "Why was I not shown this before?". Vedic Mathematics manifests the coherent and unified structure of mathematics and the methods are complementary, direct and easy. The simplicity of Vedic Mathematics means that calculations can be carried out mentally and this is very much encouraged in the Vedic system. There are many advantages in using a mental system. Starting with a short mental test, the class settle down at the beginning of the lesson and focus on mathematics; they enjoy the challenge of using only their own mind to solve problems; the questions in the test can revise the previous lesson and lessons and introduce ideas to be used in the present lesson. Although the system encourages mental calculation, apart from the initial test at the beginning of the lesson its use in the rest of the lesson is not insisted upon. It is important that the pupil's study is fun and enjoyable and they should not be forced to do what they find too difficult, though the able ones may enjoy doing nearly everything in their head. There are many advantages in a system which emphasises mental mathematics and these are discussed in some detail in the introduction to reference 2. Learning mathematics should be a delightful experience for all children and they should all succeed in it. The Cosmic Computer course offers a complete system of mental mathematics which can be taught in a holistic way. The straightforward and beautifully interrelated Vedic methods mean that mathematics can be done mentally, and this and the many methods of solution which the Vedic system offers, encourages flexibility and innovation. This in turn leads to the development of creativity and intuition. The Vedic system does not insist on a purely analytic approach as many modern teaching methods do. This makes a big difference to the attitude which children have towards mathematics. Being naturally creative students like to devise their own methods of solution. The Vedic system seeks to cultivate intuition- having a conscious proof or explanation of a method beforehand is not considered essential in the Vedic methodology. Students are shown general methods and also special methods which apply in special cases. This means they do not rigidly have to follow a certain procedure but have a choice and are encouraged to invent their own methods. Every problem is unique and invites its own style of solution. The Vedic system does not impose unnecessary restrictions- we can for example work from left to right or right to left; with numbers which are partly positive and partly negative; we can work 2 or more figures at a time and can feel comfortable with long numbers. These benefits of the Vedic system have been observed where it has been used. Pupils become generally more focused, confident and intelligent. The Vedic system use a collection of sixteen Sutras (or formulae), given in word form, and some sub-Sutras. These are listed in the front of each book and express fundamental principles which run like threads (the word "Sutra" means "thread") through the whole of mathematics, unifying diverse topics. They are extremely useful in education for this reason. asked how many triangles there are in this figure you can easily get the answer. There are sixteen of these but did you notice how you could mentally make the various shapes stand out- seeing some lines and ignoring others, and then seeing different triangles- at will? The Vedic formula By Alternate Elimination and Retention describes this attribute of our mind and has many more obviously mathematical applications also (in eliminating first x and then y when solving a pair of simultaneous equations, for example). The universe appears lawful, at every level, and nature is able to respond instantly to every situation that occurs everywhere in the universe. Nature appears to employ a Cosmic Computer which governs all action with the utmost precision. The Unified Field chart (invented by Maharishi Mahesh Yogi) is given at the beginning of each Teacher's Guide and shows the whole subject and how it develops sequentially. This means the student can always easily see where they are in relation to the whole. Other subjects- chemistry, computer science for example- all have their own Unified Field chart showing their structure and development, and any part of a Unified Field chart can itself be expanded into a Unified Field chart. The term "Unified Field" comes from modern Physics and refers to the unified field of all the various forces of nature. This ultimate level of existence corresponds in subjective terms to the self. So the Unified Field is at the basis of creation just as your self is the observer of creation, and therefore any structure, like Mathematics, must unfold from here- from unity into diversity. As the structure develops from the base the terms get more and more concrete as the three branches of Arithmetic, Algebra and Geometry develop. The first level above the Unified Field: zero, equality, empty space, gives a quality of that branch which also has the infinite, abstract quality of the Unified Field. Next, unit, symbol, point give a more concrete base for the development of the three branches. Each of these, with three further concepts allow the development of numbers and number systems, algebraic expressions and geometrical forms. These develop further into all the various areas of Arithmetic, Algebra and Geometry. In some cases, graphs for example, a topic is a mixture of two or all of the three branches. The large box shows all the various topics studied in the Cosmic Computer books and so the student always knows where they are in relation to the whole. The contents of this box change from book to book, as the topics studied change. The Transcendental Meditation referred to on the chart is a simple technique for bringing the mind to a quiet state where it can consciously experience the Unified Field. The extent to which this chart is used is left to the discretion of the teacher. This course follows the requirements of the National Curriculum for England and Wales and at present three books are available. The course is intended to cover the first three years of a secondary school course (that is starting with 11 year old pupils), but may be suitable for other classes too. Some of the material is very suitable for children aged from 8 years. The textbook is intended to supplement the course, rather than being used for individual study and the course is intended to be delivered as whole class teaching. The text is however self-explanatory and so the pupil who misses some lessons in school would still be able to continue. The reason for writing the book in this way is more for the benefit of the teacher- who will probably be unfamiliar with the Vedic system. Lessons begin with a mental arithmetic test of 10 questions (included in this Guide). Answers are given at the end of the test and any difficulties are dealt with. The teacher then introduces the lesson for that day. This Teacher's Guide gives, in the Notes, any points of special interest for each chapter and other suggestions. (Some additional material will also be found there for Book 1, on geometry.) There are plenty of Extension Sheets for more able or fast pupils and many of these are very appropriate for the whole class to work on. Revision Tests are also contained in the Teacher's Guide and these revise the previous 4 or 5 chapters. There are also worksheets, games etc. There is also an Answer Book which contains answers to all the exercises and other numbered questions that come up in the text. The Answer Book is intended to be made available to the class to check their work. d) introduce or revise ideas needed in the current lesson. Underlined questions in the tests, and diagrams, are intended to be written up on the board. The tests are marked immediately at the end- they can mark their own or exchange with a neighbour. They could record their marks. Any misunderstandings and errors can be sorted out when they are marked- a quick explanation for each answer can also be given. The tests can also be diagnostic- the books could be taken in to see who got what right or wrong, and it is useful to ask at some stage of the marking 'who got this right?' (which of course tells you who didn't). The tests should not be too slow: repeat each question but decline to say it a third time unless for a good reason, then go immediately on to the next question. Occasionally a test can be speeded up (with warning). The tests, and answers, should not take long. Hints or reminders can be given if a question draws a blank response. The tests are also intended to be flexible: questions can be changed if they are too easy or too hard or if extra revision of some topic is needed (but the aim would be for most pupils to get most of the questions right). It should also be easy to improvise extra tests if there are not enough, even if it means giving an earlier test with the numbers altered. In some of the later tests working out could be allowed for question 10.